What are the different Flatness Testing Methods for Surface Plates? Topic: What are the different Flatness testing methods for Surface Plates? The surface plate is a massive solid structure, highly rigid in design which is having a true flatness of the surface. In metrology, the Surface plate is used as a measuring base or a datum surface for testing of flatness of surfaces. Surface plate forms the basis of the measurement. Surface plates are widely used in where the inspection is carried out. So Surface plate will become a working standard. But how actually we can measure the flatness of the surface plate to ensure it can be used as a working standard. What is actually Flatness means? Flatness testing is something similar to the straightness testing. There are various methods are available for flatness testing. We have listed them below. These are the available methods for flatness testing of the surface plates. A surface of the liquid is used as the reference to measure the flatness of the surface plate. see the below apparatus. There are two cylinders connected by a rubber tube at their bases. We can use mercury or a diluted soda solution as the liquid in the apparatus to take the liquid surface as the reference. There is micrometre head is fitted with a conical tip on their spindle on both of the cylinders. This tip will be going to have contact with the liquid surface in the cylinder by adjusting the spindle vertically with micrometre head. By this way, we can note down the micrometre readings on both cylinders by making contacting the liquid surface with a conical tip. Again adjust the micrometre heads to make the conical tips contact with the liquid surface. If there are any deviations in the surface plate there must be deviations in the micrometre readings too. By this way, we make one cylinder in the same position and moving the second cylinder to different positions on the surface plate to identify the deviations in the flatness. One quick caution is that the rubber tube should not contain any air bubbles. The electric supply is used to make sure the conical tip contacting the liquid surface or not. Usually, Beam Comparator is used to determine the straightness of the surface. A beam provided with three supported feet. One is fixed at the centre of the beam and the remaining two were fixed at both ends of the beam. The centre foot is fixed whereas the other two at the ends are relatively adjustable. A spherical plunger is also attached to at the middle (as shown in the above diagram) to prevent the beam from the overturn. A dial indicator is fixed on the beam with a plunger. all these feet and plungers must and should be lies within in a plane passing thru the endfeet. 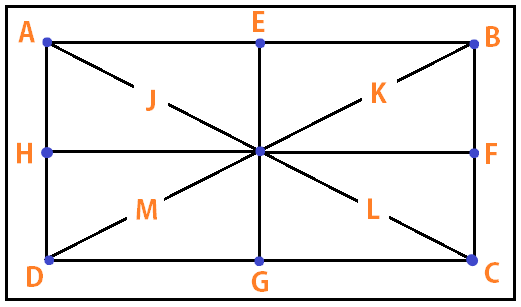 As you can see in the below picture the surface place spotted with some points(A, B, D, E, F, G, G, I, J, K, L, M). these places where we will put the feet and find out the straightness of the path AB, AC, AD…..
By comparing the straightness of each line joining the surface plate and with a known reference straight edge with the help of dial indicator. In the same way, by displacing the middle feet over the surface plate on the generators(AB, AC, AD, HF)and take the observation in the dial indicator. Here are their Generators representing on the surface plate.